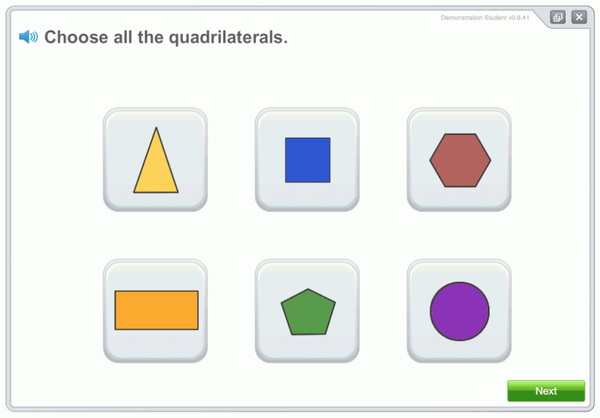 The Symphony Math Benchmarker is a computer adaptive test that identifies the precise instructional level of each student, providing a base-line for intervention and progress monitoring. The Benchmarker allows more of an opportunity for students to demonstrate their knowledge and reject their at-risk or borderline status. The Symphony Math Benchmarker adaptive testing engine dynamically locates each student on a standardized scale of mathematical ability. The test is based upon an item bank of 900 test items that were specifically designed to measure progress against the Common Core State Standards (CCSS) for Mathematics. Benchmarker test items have been calibrated and organized on a scale of low difficulty to high difficulty; the program applies Item Response Theory algorithms which move the student to an easier item after an incorrect response, and to a harder item after a correct response. Each student begins the Benchmarker with an assessment item that is two years below the student’s enrolled grade level. Depending on the student’s pattern of correct and incorrect responses, the test items will become more or less difficult. A student may see between 18 and 24 assessment items during a Benchmarker session. Benchmarker ends the assessment after it has seen enough responses to determine the student’s location on the standardized scale of CCSS mathematics ability. Symphony Math supports Response to Intervention, helping assess and develop indepth understanding of mathematics. Some screeners used for Response to Intervention only measure fluency, or focus on a single skill, and are not aligned to the depth and rigor of the Common Core State Standards. However, using Symphony Math minimizes the chance that an at-risk student might quickly learn a skill needed to pass the fluency screener (e.g. single digit addition) without acquiring the in-depth and rigorous understanding necessary to succeed in a CCSS curriculum. All students receive a standardized score on a common vertical scale which reveals how the tested students performed in comparison to grade-specific national norms. Because Symphony Benchmarker scores are expressed on a vertical scale, students’ scores can be readily compared across grades. We all expect that most first-graders have learned more than most kindergartners, most second-graders have learned more than most first-graders, and so on. 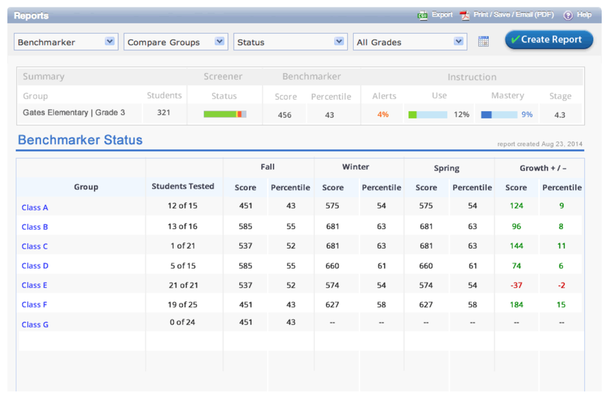 With Symphony’s scale scores, teachers can track performance regardless of assigned grade, allowing tracking of students across grades, thus supplying a detailed picture of their progress over time. The Symphony Benchmarker is given in the beginning, middle, and end of each school year, and testing windows can be customized by Administrators so that students receive the assessments at appropriate times for the school and district.